Giuseppe Tornatore, director of Cinema Paradiso (1988), tackles the refined and insular world of fine art with his first English language feature The Best Offer. 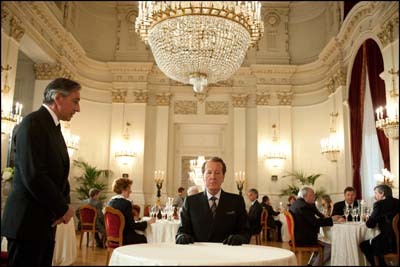 Set in Europe, the film follows the highly esteemed and eccentric art auctioneer Virgil Oldman (Geoffrey Rush), a man who is unable to connect with others save a select few, including his good friend Billy Whistler (Donald Sutherland). It’s through his relationship with Billy that Virgil acquires his most prized art pieces, sometimes illicitly, in the form of women’s portraits by master painters, some of them master forgers. In a secret back room behind a closet devoted to housing Virgil’s gloves, Virgil lovingly presents his collection of women, the only women he has ever come to love, and who love him in return through passive stares. That is, until a mysterious phone call from a young heiress, Claire (Sylvia Hoeks), plunges Virgil into a lucrative appraisal job as well as a strange obsession with an agoraphobic woman who refuses to be seen in public. The Best Offer is a film seeped in atmospheric uneasiness and solemnity. Claire’s family art collection is housed in a run down villa that is as neglected as its sole tenant. Confining herself to one room masked behind a mural painted wall, Claire begins a strange relationship with Virgil that begins tempestuously as the two slowly feel out a working relationship with each other, and gradually becomes a life-changing experience for Virgil. With each visit, Virgil finds himself more enamored by his strange employer, and seeks the advice of Robert (Jim Sturgess), a young artificer, who in addition to giving Virgil love advice, also assists him in restoring a centuries old automaton out of pieces discovered at Claire’s villa. Amidst the eeriness of this backdrop, Tornatore infuses the film with beautiful, if somewhat contradictory, design aesthetics including classicism alongside aspects of steampunk to give the feeling of a story devoid of a place and time. In the world of glamorous auction houses and million dollar paintings, time is fluid. A woman sitting for a portrait a few hundred years ago still inspires those who look upon her today, and in the case of Virgil, remains as the only intimate relationship he has come to know. There is such great sadness and darkness in this film, and Tornatore never once allows us the pleasure of feeling secure amongst such troubled people. Above all else though, The Best Offer is a caper that is at its best when Claire is still a mystery, and Virgil is still a sympathetic curmudgeon. There are many secrets to unravel in this film and unfortunately its one great flaw is that more questions then answers are revealed by the film’s end. The art of forgery is a recurring theme and one that is used to great effect to save an otherwise mediocre ending. Virgil is an expert at detecting “fakes” but sees a beauty in the works all the same, as he states, it’s impossible for a forger to not include a piece of themselves in their work. The Best Offer is an aesthetically pleasing film that spends more time fleshing out the mechanics of its philosophy than the logistics of a good caper. Luckily, I care more about the former than the latter. It’s certainly worth a look for Tornatore’s directorial stylings and Ennio Morricone’s masterful score. The Best Offer makes its Philly debut at PhilaMOCA this Sunday, with repeat showings on February 16th.